Complete the form for more information about our care agency software. Powerful but easy-to-use domiciliary care management software, customised for your agency. We provide bespoke, customised management software for Home Care Agencies. We don't try to make you fit our software, we tailor our software to fit you. Our objective is to make caring easier. If home care agencies spend less time on administration, they can spend more time on looking after their clients. Client care plans can be developed and used to detail tasks that need carrying out when a carer attends an appointment. Whomever attends, they will have access to the client notes, history and any messages relating to the wellbeing of the client. Schedules are automatically updated so carers and clients know who is attending an appointment and when. Management can assign, reassign or cancel appointments easily and the new carer has access to the client notes before they attend. Emails can be sent to client relatives when carers arrive and leave an appointment. This greater visibility leads to more trust and less client worry. Reports on attendance, outcomes and task completion are built in. Reduce Paperwork, Increase Visibility and Provide Better Care. Our domiciliary care management software is especially useful for clients whose relatives live some distance away and want to keep up-to-date with the excellent care being provided. 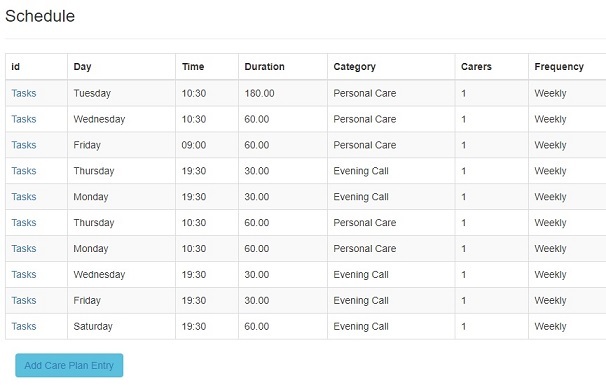 The system sends notifications to relatives (and management) when carers arrive and leave an appointment. It provides carers with a task list to be carried out and enbles them to record when they have completed the tasks with any other details of the appointment. Information can be quickly and easily entered into the system via an internet connected smartphone. No downloads or other set up is required. By allowing management and client relatives access to completed appointment notes and upcoming schedules, everyone has a clear understanding of who and when is attending and what will be done during an appointment. Developed in partnership with Cheadle Care Agency - Deckchair Care, our Home Care Software is proven to save time, provide piece of mind and enable efficient domiciliary care agency management. By replacing paperwork with an efficient online system, recording notes is quicker, simpler and less time consuming. Everything previously recorded on paper can be replicated by our Homecare Software. Including: medication records, dental notes, hygiene, body map records and much more. Moving to a secure online system allows clients, carers and management access to the same information at the same time. Clients only have access to their relatives appointment notes. Management have access to everything. Client Care plans are as flexible as a paper-based system, just much quicker to set up, change and manage. Care plans are made up of a schedule of appointments - each of which has a task list assigned that needs to be carried out on attendance. Care Plans are an essential part of domiciliary care. As a care agency manager, you will be familiar with the rafts of documentation that needs to be updated and recorded for each appointment. Moving to a secure online management system is easier than you may think and will save time and money whilst ensuring compliance with CQC regulations. During an appointment your carers will have access to essential client notes and appointment history. They will know exactly what needs to happen during the appointment and be able to record when a task is completed - or why it hasn't. Clients are notified when an appointment starts and finishes, and they have access to the results of the appointment which, in our experience, provides a great sense of reassurance - something they may not get from other care agencies. Moving to an online system means everyone having real-time access to information. Managers can proactively suggest improvements to the care plan. Reports are automatic and client relatives are reassured that their relatives are receiving the best possible care. Based on the individual clients care schedules and carer availability, the system highlights when appointments need assigning and if there are any gaps in the schedule. Carers are able to record the outcomes of appointments quickly using an internet enables smart phone. The system is simpler than sending a text and the results are available instantly online. Management are able to edit appointment details in cases of mistakes, but carers are not allowed to edit appointments once completed. No need for carers to carry round sensitive client data, for example keysafe numbers. Invoicing, payroll and mileage expenses are all calculcated automatically for accounting. If a carer is unable to attend an appoinement, quickly reassign it to another available carer. They will instantly have access to the previous appointment notes, history and contact numbers. Real-time entering of appointment detail allows for instant response and quicker alerts if needed. Mobile access to comprehensive data including customer details, appointment task details, previous appointment notes, and any special requirements. In addition to providing access for management and carers, our Homecare Software also provideds an interface for client relatives to access appointment and scheduling information. Clients, Managers and Carers all have access to different parts of the system. So Clients can only access their own data, carers can only see their appointments and managers can see everything! At centre of the system is the client. This then leads to a Care Plan being established (schedule of visits). Mangement can then add in tasks to each visits for the carer to complete. Get notified if carers are late for appointments or running over with a client. Easy to use reporting provides management and clients with increased, real-time visibility. When did the carer turn up and leave? Were all the tasks carried out? How much are we invoicing this month? etc. "They regularily keep us informed of her well-being, we use the Personal computer portal which allows us to access information about the times they arrive, times they leave." "The portal provides additional reassurance and reaffirms the essential principles of transparency, continuity and working WITH families to ensure appropriate individualised care packages." "The web portal is brilliant, letting us know what has happened during the care visit in additional to assessing Mum’s well being. This helps us to be informed and proactive with her care." In the Homecare world, things change often and quickly. 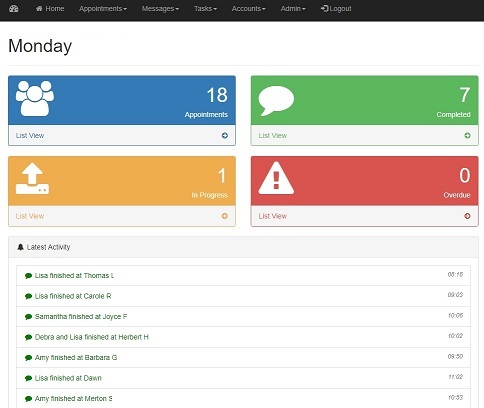 We provide an easy to use interface for assigning appointments based on availability. 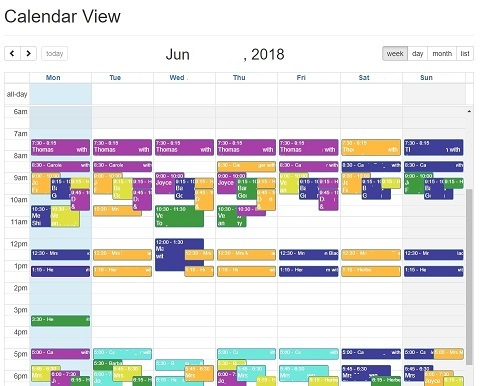 There is a calendar view of all the appointments and scheduling reports so your carers get the right amount of hours. Homecare-Software.net includes a billing engine that reports on client appointments and provides a detailed summary and service cost. Homecare-Software.net calculates carer wages based on their salary and hours worked (including mileage expenses), these figures can then be entered into your payroll system. *Quoted in advance, if required. Simply fill in the form at the top of this page and we'll provide you with more information. If you are just looking for off-the-shelf home care management software, then we can get you set up quickly and email across instructions. This can work, but we prefer Step 2. This isn't a hard sell, it just has a much better chance of helping! We believe collaboration leads to a better outcome for our clients. So, we like to visit new clients to discuss exactly what help might be needed. We also demonstrate the core system and show how it can be customised. It could be that the system is a perfect fit (after all it has already serviced thousands of appointments). In which case we can get everything set up for free and you just pay the license costs above. If some customisation is needed - after all not every agency works the same way - we'll provide a proposal which includes functions, timescales and costs. This will outline how your new management system will work, save you time and help you provide outstanding care. Costs for this vary depending on the amount of work that is required. Branding and logos are free. Simple add-on functions start at £150. More complex reports or notifications can cost up to £300.